Victor, created by a research professor at Carnegie Mellon University, is the latest in a series of social robots designed to study human-robot interaction. Victor sits in the lounge of Carnegie Mellon University’s computer science building ready to take on anyone in a game of Scrabble. He’s cocky, and his taunts can be heard across the room. “Is that all you’ve got?” he shouts from behind his virtual Scrabble board. Victor has an attitude not atypical of a 17-year-old college freshman. But here's the thing: He’s a robot. 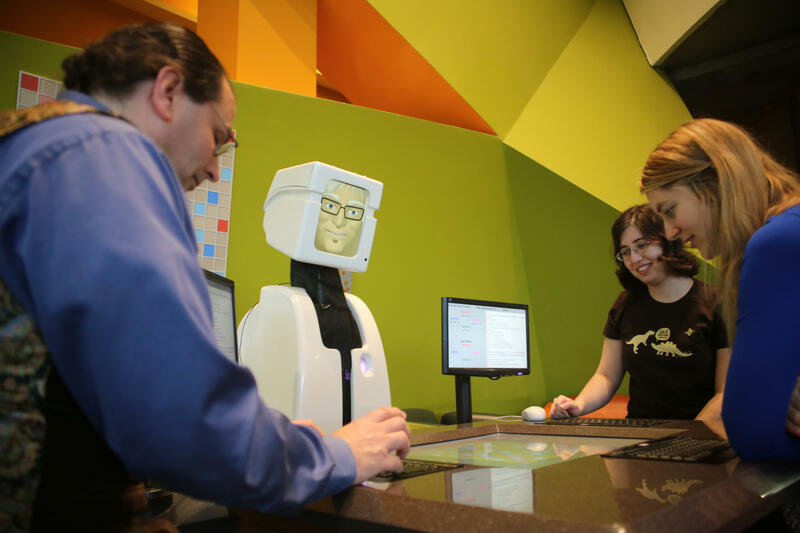 Created by Reid Simmons, a research professor at CMU’s Robotics Institute, Victor is the latest in a series of social robots designed as a tool to study human-robot interaction. Simmons said he looks forward to the day when robots become part of everyday life, but before that can happen, researchers need to find out what it takes for humans to be comfortable around the animatronic machines. Simmons and his team are using Victor to study how mood changes affect a human’s willingness to interact with robots and how personalization plays into long-term interaction. So when it comes to Scrabble, Victor’s skill is actually mediocre at best. He has an 8,600-word vocabulary, which doesn’t begin to compare to the 178,000 words that make up the Official Scrabble Player Dictionary, and he doesn’t bother with double- and triple-word scores. He has no arms to move his tiles; instead Victor places his pieces electronically, while challengers drag their fingers across the screen to place theirs. During a game, Victor will lower his head in concentration or stare into the eyes of his opponent while critiquing their moves. A light on his chest will change hues and pulsate at different speeds depending on his mood. Simmons said Victor has the ability to learn emotional responses through gameplay experiences with different players over time. Victor’s backstory, dialogue and personality were developed by Michael Chemers, an associate professor of theater arts at the University of California, Santa Cruz and members of CMU’s drama department. Victor’s attitude is “edgy enough to be engaging, but not so much that people don’t want to play,” Simmons said.